I’m sure many of you are aware of the medicinal properties of basil leaves. But do you know the medicinal qualities of the basil seeds. Basil seeds are called as “Sabja Seeds” in Tamil and Hindi and is used in the making of a milk based drink called “Falooda” and other fruit juices as well. 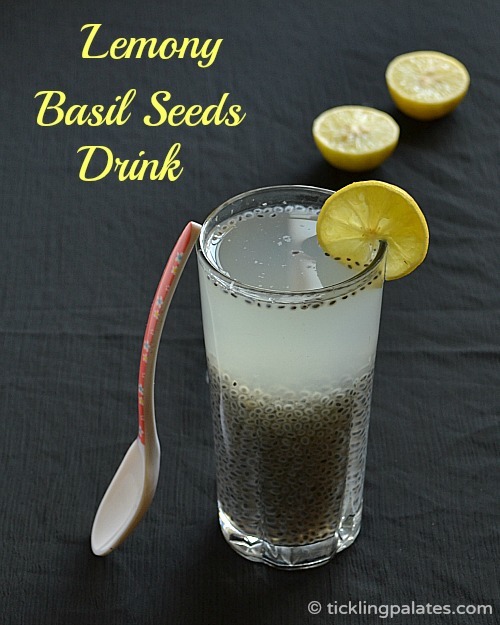 Today’s recipe is not even a full fledged recipe but it is to explain about the good qualities of the basil seeds and why it is good for you especially during summer when the sun is totally unforgiving. The seeds look similar like black sesame seeds and are a bit smaller comparatively and you need to soak them in water. 2 minutes of the seeds in water and you can see it absorbing the water and become jelly like. You can eat it as it is with a spoon. While the outer layer will be soft and smooth like jelly, the center will be crunchy like when you eat seeds. The basil seeds are a natural laxative which helps to cure constipation that is caused by excess body heat during summer. It also happens to be an excellent natural body coolant and is known to cure urinary tract problems which are once again normal during peak summer time. My Grandmother had a lot of basil plants in her place and we used to collect the seeds by ourselves. The flowers are let to mature and dry in the plant itself. They are then pulled off and spread on a sheet or cloth and covered once again with a clean cloth on top. They are let to dry completely. All we have to do s rub the dried flowers between our hands and blow away the small petals and you will have small black basil seeds. We used to collect them and further dry them before storing them in dry, clean jars. 1. In a small bowl place the basil (sabja) seeds and pour 1/2 cup of water and let it stand for 10 – 15 minutes. 2. You can see the seeds absorbing the water and become big in size while forming a white jelly like cocoon around it. 3. Cut the lemon and squeeze the juice in a pitcher. Add salt, honey, soaked basil seeds and chilled water and mix well. 1. As the basil seeds settle at the bottom, instead of serving with a straw, place a stirrer or spoon for easy mixing and drinking. 2. You can replace honey with sugar, artificial sweetener or jaggery and adjust according to your taste. Absolute love it, I have not heard of adding these seeds in lemonade and I like how you used honey instead of sugar to make it healthier. I guess I can add “Chia Seeds” too instead of basil seeds. Please do send it to my “Healthy Me & Healthy Us” event (read the rules). Wonderful shot..Drinks looks very tempting with basil seeds..
we would also collect the basil seeds from the flowers. your post refreshed those sweet memories. we would add them in rose sherbet or rooh afzha. Definitely a thirsty quencher and a beautiful body cooler,prefect summer drink. wow looks great! useful post perfect for this wheather! I’ve been thinking of buying some basil seeds to make Falooda…what a lovely lemonade recipe and all those wonderful health tips…Thanks!! Refreshing and different lemonade recipe! I ain’t a huge fan of basil seeds but my mother has forced me to buy these organic basil seeds from The Organic Garden. Now i am was finding various ways of gulping them and then I came across this drink! This is visually satisfying and I am eager to try it out.